The first settlers (about 1784) to the area were French fur traders who wintered near Lac Courte Oreilles. At that time the Ottawa Indians (close relatives to the Ojibwas) inhabited the area. The major waterways of the Namekagon and Chippewa rivers allowed for easy travel around the entire region. Travelers down the Namekagon could reach the St. Croix and Mississippi rivers without portages. The Chippewa was used to go north to the Bad River and eventually to Lake Superior with a difficult portage at Glidden. Fur trading was prominent in the area until 1839 when the first sawmill was constructed near Chippewa Falls. 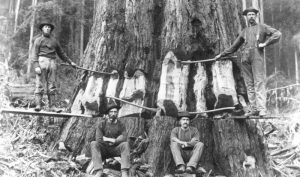 There were 50 logging camps in Sawyer County during the peak years of 1880-1890. The last log drive was made down the Chippewa River in 1917. Sawyer County was created on March 9, 1853. Agriculture began twelve years later. Immigrants practiced slash-and-burn agriculture as they came to the area via railroads. By 1940 there were 1300 farms covering over 129,000 acres. In 2007 there were 231 farms in Sawyer County covering about 47,000 acres. The first fishing resort was established on Spider Lake in 1892 and catered primarily to lumbermen. As railroads lines became more established and better roads were constructed, the tourist industry began. Fish and game quickly became economic factors as the tourist industry grew. Other forms of recreation such as hunting, skiing, boating and riding soon became popular. This increased opportunities for year-round residents to make a living. Office Hours are on Thursdays 12:00 pm (noon) - 6:00 p.m. and other times by appointment. Town Board meetings are held the second Thursday of each month at 6:30 p.m. Land Use Plan Commission meetings are held the last Wednesday of each month at 4:30 p.m. All meetings are held at the Town Hall located at 10625 N County Road. © 2017 - All Rights Reserved. | Website Development and Design by CCS, Inc.